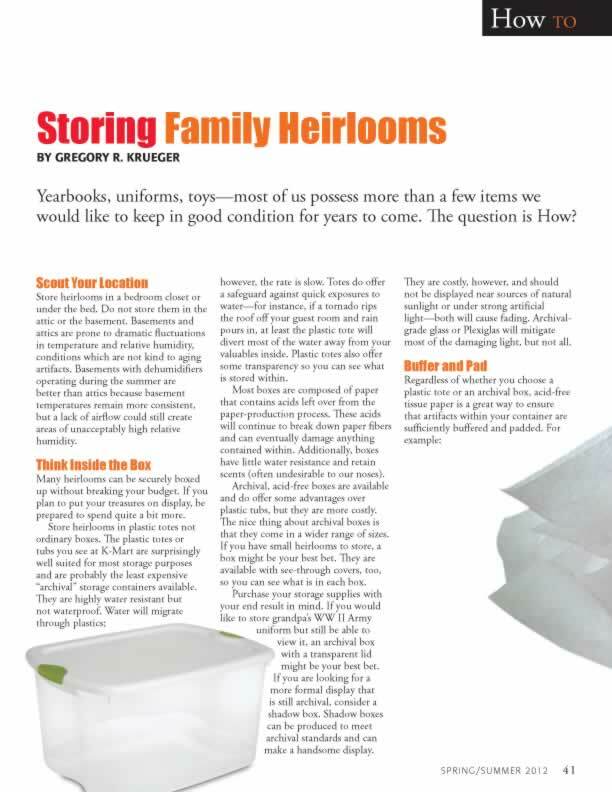 Store heirlooms in a bedroom closet or under the bed. Do not store them in the attic or the basement. Basements and attics are prone to dramatic fluctuations in temperature and relative humidity, conditions which are not kind to aging artifacts. Basements with dehumidifiers operating during the summer are better than attics because basement temperatures remain more consistent, but a lack of airflow could still create areas of unacceptably high relative humidity. Gregory R. Krueger is curator of the Lynchburg Museum System. He is a native of Wisconsin and a graduate of the University of Wisconsin with an undergraduate degree in history and a master’s degree in public history. He joined the editorial board of Lynch’s Ferry magazine in 2006.